• Cardi is sized to fit Women’s X-Small (Small, Medium, Large, X-Large, XXLarge). • 7 (8, 8, 9, 9, 10) 50 g (155 yd) balls Austermann / Skacel Collection Algarve (100% mercerized cotton) color #036 Kiwi. • 22 sts x 36 rows = 4″ in Slip st patt using larger ndls. • Cardi is worked in an all-over Slip-st patt, on Rev St st background, from chart or written instructions. • While working shaping, do not work an inc (yo) without a compensating dec.
• Placing a marker each side of extra 4 sts (if used for size being made) will help keep track of complete 8-st reps on the rest of the piece. Slm every row. dcd (double centered decrease) On RSRs, slip 2 sts tog kwise (as if to K2tog) to RH ndl, K1, p2sso (pass 2 slipped sts over). OnWSRs, slip 2 sts tog pwise-tbl, P1, p2sso. Note: The center st (slipped st from previous rows) will be the center st of the double dec. Note: Some sizes are a multiple of 8 sts, others a multiple of 8 + 4 sts; work extra 4 sts in patt. If they are the last 4 sts of a row, work as beg of next rep; if they are the first 4 sts (Right Fronts) work the last 4 sts of rep, then cont in patt. Work first and last st as edge sts on all sizes. K1 (edge st – keep in Garter st); purl across to last st; K1 (edge st – keep in Garter st). Rows 2, 6,10,14,18, 22, 26,30 and 34: Knit. Row 3 and 31: K1; * *P1, sl 1; rep from * across to last st; K1. Rows 4, 8,12, 16, 20, 24, 28, 32 and 36: K1; knit the knit sts and sl the sl sts as they face you across to last st; K1. Rows 7 and 35: K1; *[sl 1, P1] 2 times, sl 1, P3; rep from * across to last st for desired size; K1. Row 11: K1; *[P1, sl 1], twice, P4; rep from * across to last st for desired size; K1. Row 15: K1; *P2, sl 1, P5; rep from * across to last st for desired size; K1. Row 19: K1; *P6, sl 1, P1; rep from * across to last st for desired size; K1. Row 23: K1; *P5, sl 1, P1, sl 1; rep from * across to last st for desired size; K1. Row 27: K1; *sl 1, P3, [sl 1, P1] twice; rep from *across to last st for desired size; K1. Rows 38-46: Rep Rows 2-10. Rows 47 and 48: Rep Rows 15 and 16. Row 49: Rep Row 15. Row 50: K1; *knit to sl st, yo, dcd, yo; rep from *across to last st for desired size; K1. ow 51: K1; purl across to last st; K1. Rows 52 and 54: K1; knit to beg of first full rep (if necessary for desired size), *K1, sl 1, K7; rep from * across, ending the last rep by knitting to end. Row 53: K1; purl the purl sts and sl the sl sts as they face you across to last st; K1. Row 55: K1; *purl to sl st, yo, dcd, yo; rep from * across, ending last rep by purling to end. Rows 57-71: Rep Rows 47-56 once, then Rows 47-51 once. Rows 72-78: Rep Rows 26-32. Rows 79 and 80: Rep Rows 37 and 38. Row 81 and 82: Rep Rows 7 and 8. Rep Rows 1-82 for Slip-st patt. Next row (WS): Beg St st and work even for 6 rows, end after RSR. Turning Row (WS): Knit 1 row. Change to larger ndls. Next row (RS): Cont in St st, work 6 rows, end after WSR. Fold hem, WS’s together; remove WY and place sts on a spare ndl. Joining Row (RS): K 1 st from spare ndl tog with 1 st from main ndl across row. Knit 1 WSR (Garter ridge). Next row (RS): Beg Slip-st patt (from written instructions or chart), working first and last st of every row in Garter st (edge sts) as foll: K1 (edge st); work 8-st rep 11 (12,14,15,16,18) times, then first 4 sts of rep 0 (1,0, 0, 1,0) time(s); K1 (edge st). Work even until piece meas 11 (12 1/2 1/2,13,1312,14)” from CO, end after WSR. Next row (RS): BO 3 (4, 6, 7, 9,11) sts at beg of next 2 rows [84 (94, 102, 108, 116, 124) sts rem]. Next row (RS): Dec 1 st ea side EOR 4 (6, 7, 8, 9, 12) times [76 (82, 88, 92, 98, 100) sts rem]. 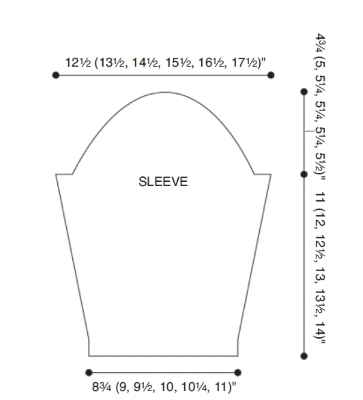 Work even until armhole meas 612 (7, 7 1/2, 8, 8 1/2, 9)” from beg of shaping, end after WSR. PM ea side of center 32 (34, 34, 36, 36, 38) sts for neck. (RS): Removing m’s as they appear, patt across to first m, join a second ball of yarn and BO center sts, patt to end [22 (24, 27,28, 31,31) sts rem easide]. Working both sides at same time, work 1 WSR even. Next row (RS): BO 7 (8, 9, 9,10,10) sts at beg of next 4 rows, while at the same time, on first row of shoulder shaping, at ea neck edge, dec 1 st [7 (7, 8, 9.10.10)	sts rem ea shoulder]. BO rem sts. LEFT FRONT: With smaller ndls, WY and provisional CO of choice, CO 42 (46, 54, 58, 66, 74) sts. Next row (RS): Beg Slip-st patt, working first and last st of every row in Garter st (edge sts) as foll: K1 (edge st); work 8-st rep 5 (5, 6, 7, 8, 9) times, then first 4 sts of rep 0 (1, 1,0, 0, 0) time(s); K1 (edge st). Work even until piece meas 11 (12,12 1/2,13,13 1/2,14)” from CO, end after WSR. Next row (RS): BO 3 (4, 6, 7, 9, 11) sts, work to end [39 (42, 48, 51, 57, 63) sts rem]. Next row (RS): Dec 1 st each side EOR 4 (6, 7, 8, 9, 12) times [35 (36, 41,43,48,51) sts rem]. Work even until armhole meas 2 (2 1/2, 3, 3 1/2, 4, 4 1/2)” from beg of shaping, end after RSR at neck edge. Next row (WS): BO 6 (6, 7, 8, 9, 11) sts, work to end. Work 1 RSR even. Next row (WS): At neck edge, BO 2 sts 2 times, then BO 1 st 4 (3, 4, 4, 5, 6) times [21 (23,26,27, 30, 30) sts rem for shoulder]. Work even until armhole meas same as Back to shoulder shaping, end after WSR. Next row (RS): At armhole edge, BO 7 (8, 9, 9, 10.10)	sts EOR twice. Next row: BO rem sts. Work Hem as for Left Front. Next row (RS): Beg Slip-st patt, working first and last st of every row in Garter st (edge sts) as foll: K1 (edge st); work last 4 sts of rep 0 (1, 1,0,0, 0) time(s); work 8-st rep 5 (5, 6, 7, 8, 9) times, K1 (edge st). Work even until piece meas 11 (12,12 1/2,13,13 1/2,14)” from CO, end after WSR. Work as for Left Front, working armhole and shoulder shaping at beg of WSR and neck shaping at beg of RSR. With smaller ndls, provisionally CO 50 (50, 58, 58, 66, 66) sts. Next row (WS): Work as for Back. Next row (RS): Beg Slip-st patt, working 1 st ea side in Garter st (edge st), rem sts in patt. Work 2 rows even, end after WSR. Next row (RS): Beg this row, inc 1 st ea side every 8 (6, 8, 6, 8, 6) rows 9 (12, 11, 14, 12, 15) times [68 (74, 80, 86, 90, 96) sts]. Work even until piece meas 11 (12, 12 1/2, 13, 13 1/2, 14)” from CO, end after WSR. Next row (RS): BO 3 (4, 6, 7, 9,11) sts at beg of next 2 rows [62 (66, 68, 72, 72, 74) sts rem]. Next row (RS): Dec 1 st ea side EOR 18 (19, 20, 21,21, 22) times [26 (28, 28, 30, 30, 30) sts rem]. Next row (RS): BO 2 sts at beg of next 4 rows [18 (20, 20, 22, 22, 22) sts rem]. BO rem sts. Block pieces to schematic measurements. Join shoulder seams. Set in Sleeves. Sew Sleeve underarm seam and side seams, matching patt. With RS facing, using larger ndls, pick up and K1 st for ea st and 3 sts for every 4 rows around neck shaping. Next row (WS): Beg St st; work 6 rows, end after RSR. Turning Row (WS): Change to smaller ndls; knit 1 row. Work 6 rows even in St st. BO all sts loosely. Fold band to WS and slip st in place. With RS facing, using smaller ndls, beg at Left neck edge (Turning Row of neckband), pick up and knit 3 sts for every 4 rows down center Front to lower edge. Work as for Neck band, fold band to WS and slip st in place. With RS facing, pm for 6 buttons evenly space along Right Front. Pick up and work 3 rows even as for Button Band, end after WSR. Next (Buttonhole) row (RS): Work to marker; *[ssk, yo twice, K2tog] for buttonhole, work to next m; rep from * 5 times, work to end. Work 2 rows even, working [K1, P1] in double yo of next row; end after RSR. Work Turning Row, work 2 rows even. Rep Buttonhole row. Work 3 rows even. BO all sts loosely. Fold to WS and finish as for Button Band. If necessary, using thin matching yarn or sewing thread, overcast edges of buttonholes through both layers. Using yarn needle, weave in all ends. I wanted to download the charts for the Jacquard vest (#14) featured in issue 171 but am unable to locate them on your website. Help!